This sounds cool. I'd love love to see the slides or better yet, a sceen-cast. Collaborative estimation and planning is a key concept for all agile development process frameworks. We will present a solution for playing "Planning Poker" that enables distributed development teams to estimate the effort of work items and build consensus in a collaborative way. The prototype uses Google Wave as a collaboration platform and OSLC (http://www.open-services.net) for seamless integration with the developer IDE and work environment. We will show a demo on how a distributed team can estimate user stories and tasks from a product backlog in a collaborative way, and instantly use the results as the base for further sprint planning. Additionally, attendees will learn some basic concepts and features about Google Wave, OSLC and IBM Rational Team Concert. Mainsoft's Team Concert to Lotus Connections integration is getting better and better. I know this because I spent about 12 hours last week offering demos of the product at Innovate 2010. The except below is from a blog post on Jazz.net about the newest preview release. You can try it now. There's a download link at the end of the post and, like Team Concert, it's nice and easy to install and configure. Growing a social network around a software project brings developers up to speed faster. New hires and teams that are added to a core team will find all the information they need in a central Lotus Connections community, including blogs, forums, wikis, file repositories, and bookmarks. These collaboration systems offer a broad teamwork base for any software project. For example, wikis can hold product specifications, blogs can be used to publish roadmaps to a wider audience, forums can be used to gather feedback from beta testers, and a file repository hosts nightly builds with download statistics and commentary features. Creating a new Lotus Connections community, or linking to an existing one, only takes a couple of clicks. 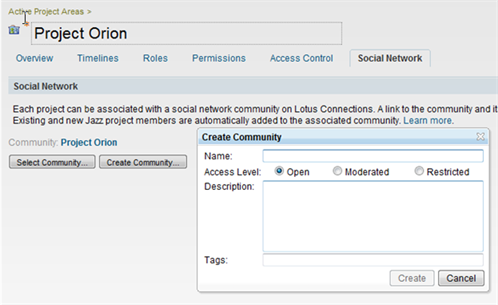 The administrator sets the Lotus Connections community in the Social Network tab under project management. Once the project community is created, all project members are added to it and as new developers join the project, they automatically become members of the project community. Dave Thomson: Why is this important? The activities involving requirements, development, build and test are not process silos. Integrating these disciplines through process automation, links between artifacts, and reporting across these links improves the productivity of teams while also improving the quality of the deliverables from those teams. 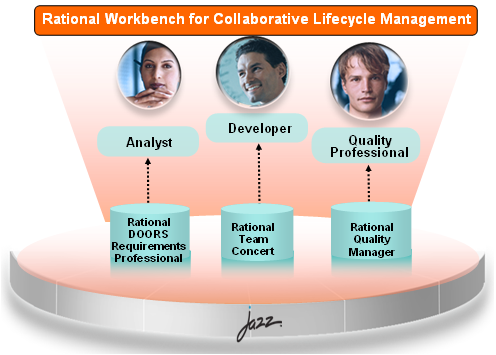 To focus this effort, were bringing Rational Team Concert, Rational Quality Manager, and a new requirements management product tentatively named Rational DOORS Requirements Professional more closely together and calling this set of products the Rational Workbench for Collaborative Lifecycle Management. Whats a workbench? A Workbench is a term we use to describe a combination of products, services, and best practices that are designed to work well together to solve a particular problem. "Even as Sun has stiffened into a slow-moving, self-entangled behemoth over the past decade, IBM has gradually shifted into the nimble mode of a start-up." "Sun is known for having a lot of cool technology but not much recognition in the market for it." "One problem: There's a lot of software overlap here. In databases, IBM has DB2 and Sun has MySQL"
Javalobby - IBM in Talks to Buy Sun? (in the comments) "Sun's energy would have been much better spent investing in writing proper Eclipse plugins for things such as Python/Groovy/Matisse/JavaFX/etc. instead of pushing their own IDE"
"the facility will be built to Leadership in Energy and Environmental Design (LEED) standards for water and energy conservation"
"we've released support for running builds in the cloud with the Elastic Bamboo feature"
"We're going to be rolling out a Sun Cloud offering later this year"
If you've been following my tweets you know that I accepted a new job yesterday. What I didn't reveal was my new employer. Before the end of this month I'll be joining IBM/Rational and working as a Web 2.0 Architect. I'm not sure how much I can say about what I'll be working on, so I won't be blogging too much about work until I figure that out. I think I can safely say this: I'm thrilled about this new job and the folks that I'll be working with. In the near term, it looks like my workmates will be @pmuellr and @BillHiggins and I'll be learning a lot about Jazz. I feel very fortunate to have found such an excellent position a fairly tough job market and I'm more than ready to start working on new things. Thanks to everybody who helped out by recommending me, blogging about me, offering encouragement and taking the time to interview with me. I have just one item for Roller Strong today: the post below from James Snell of IBM, which lists some pretty impressive stats for IBM's internal blogging system. James doesn't mention it in the post, but I've been told that the site is powered by Apache Roller v3.1. Growth: Quick note: IBM's internal blogging environment currently has 95k+ entries, 94k+ comments, 41k+ registered users, 11k+ Blogs (about 13% of which are considered active), 20k+ distinct tags, and 6k+ ratings on entries (entry rating has only been around since June of 2007). On average, there are just under 150 new entries posted to about 115 blogs per day. The number of comments per day fluctuate between 80-230 per day. A range of between 200-400 tags are used each day. Update: in the first three days of January, the server access logs show 109,439 unique visitors, 3,265,739 hits, and 61.37 GB of data transferred. And that's internal boggers only. Just think what they could do with an external blog site. Roller works well outside the firewall too. IBM getting into open source project hosting? ZDNet - IBM forging developerWorks: IBM is quietly transforming its developerWorks site into something more like Sourceforge, with more public-facing features aimed at expanding its reach to all open source developers. I haven't heard about this one before. The quote is from an ZDNet blog post about IBM striking deals with Krugle and Koders, open source code search/annotation engines. James Governor: Covalent gets its mojo back and refocuses on its core competence - supporting open source code, and doubles down on Apache projects, going back to its roots. The latest example of Covalent seeing an opportunity and nailing it is the companyâs announcement of support for the Roller blog platform. Thatâs now two companies, IBM and Covalent, making direct revenues from a platform originally built by a Sun employee, but for which Sun has no business model. Here is a hint Sun - perhaps its not software you need to sell but service and support. That is what Covalent is nailing. I appreciate the support from James and the Redmonk crew. They always seem to be rootin' for Roller. Of course I'd like to see better support for Roller all around, but at this point I can't say much beyond this: I'm focused on building a great blog platform and support is a very important part of any platform. A couple of small corrections for James. I was not a Sun employee when I originally developed Roller. Second, IBM hasn't shipped Connections, so they're not any making "direct revenues" yet. Third, I don't know if Covalent has "nailed" anything -- I haven't heard from anybody who has tried the service and I'm still trying to figure out exactly what they offer. IBM's Rob Yates blogged about Lotus Connections the other day and posted some screen-shots of the Roller-based blogging component. The UI looks different but you can tell it's Roller under the covers. Notice that they've switched out the Xinha editor with the Dojo equivalent. Elias posted some good news about some upcoming IBM contributions to Roller. We're discussing how best to get them into Roller now. Note that we now have two possible replacements for our old Hibernate back-end. We've got a Java Persistence Architecture (JPA) based back-end developed by Sun's Craig Russell and Mitesh Meswani and IBM is getting ready to contribute an iBatis based back-end. How do we choose which one to use in Roller? Consensus seems to be that we'll have a bake-off. We'll compare the programming models, test performance and discuss the pros and cons -- and let the best framework win. Lots of good news and stuff to blog this past week including the Sun makes a profit story, the Sun-Intel deal and more. I really like reading news like this Amid Profit, Brighter Days for Sun and this Sun turns profit after five quarters in red. And how could I fail to mention the announcement of Lotus Connections, the product formerly known as Ventura. Connections is IBM's new Web 2.0 social networking suite and it includes Roller. IBM's James Snell posted some background info about IBM's internal use of social networking tools and how that led to Lotus Connections. Elias Torres blogged about it too and included a screen-shot of the new Connections based BlogCentral (IBM's internal blogging site). My ApacheCon EU talk on 'Roller and Blogs as a Web Development Platform' was accepted. Looks like I'll have a busy May, Amsterdam for ApacheCon and (hopefully) San Francisco for JavaOne all in the space of two weeks. Wordpress is finally gonna get Atom format support and apparently Atom protocol support is going to happen too. The ROME project is just about ready for ROME 1.0 and there's a new subproject in the works: ROME Propono. co-worker Ramesh Mandava and I are putting together a Blog Client library (based on code from Blogapps) and an Atom client/server library (based on code from Roller). Hopefully, we'll have it ready by the time that ROME 1.0 comes out. People Over Process: IBM SWG: Lotus "Ventura"
"the most exciting thing I've seen at the event is IBM's 'Ventura' project"
"The experience of taking something built by the community and making it a product has been incredibly rewarding"
"Sprinkled throughout the entire suite is support for Atom and the Atom Publishing Protocol"
"I've been a user of IBM's internal blogging platform - known as BlogCentral, and based off of Roller - for well over a year now." 1. IBMâs BluePages (a.k.a. IBMâs employee directory): So that expertise location within the enterprise can be easier than ever having access not only to knowledge workers but also to the information behind those same knowledge workers. That is, their information. 2. Dogear: IBMâs social bookmarking application: and which I have talked about over here a few times already. 5. Roller: Or, as we all know, weblogging; yes, that is right. Ventura will have a component that would connect knowledge workers with the world of weblogs using the Roller weblogging engine, which is basically what we have been using as well inside IBM with Blog Central. I have been keeping my Intranet weblog over there for nearly three years and it would be an incredible experience to be able to see it integrate nicely into Venturaâs other components. Nifty! 6. Integration with other components: Like search or Lotus Sametime 7.5, amongst others. Actually with the inclusion of that integration with Sametime 7.5 we would be getting the best out of both worlds, synchronous and asynchronous collaboration. And all that available from a single point of entry. Can it get better than this ? Hummm. I donât think so.